This exotic combination of Singaporean Orchids and delicate Eustoma will enchant and your special someone. 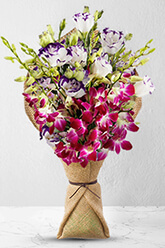 This is a very feminine and classy choice that is sure to either woo you're special lady or express your heartfelt thanks to the perfect hostess. Vase not included however, we suggest including a Standard Vase with your gift to add that special touch..
No fuss and took the stress out of having to look any further than zFlowers.com. All the local florists in my mother's town were shut over the Christmas/New Year break. zFlowers.com went out of their way to find a florist who would deliver flowers to my mother On New Year's Eve. They also rang me to get my ok for changing the flowers that I had ordered to something this florist could provide at short notice. My mother was very happy with the flowers delivered. Thanks heaps zFlowers.com. It was so easy to send a special someone lively flowers without leaving the house. The flowers arrived on time and looked exactly like the web picture. This doesn't always happen, so I'll be using you again.